This perfectly soft and on a sweet side Keto Challah Bread Recipe, or as some call it Braided Bread recipe will leave you astonished and bring the holiday season into another level of tastiness. Our Low Carb lifestyle is the best ever choice and this shows, we can bake almost anything, to be fitted into our healthy way of eating. Whether it is Easter, Christmas or just an ordinary day, our Homemade Keto Eggnog Recipe is a part of this as well. Challah bread has been used for centuries as one of the main parts of Jewish celebrations. The bread is normally yellowish in color because of using a substantial amount of eggs in it. 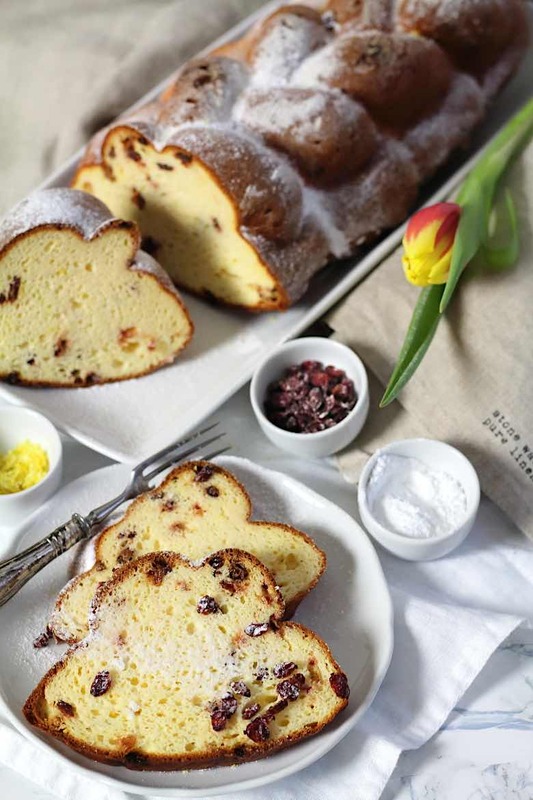 I have only found out about Challah Bread actually existing when I have started searching for the name of this recipe. 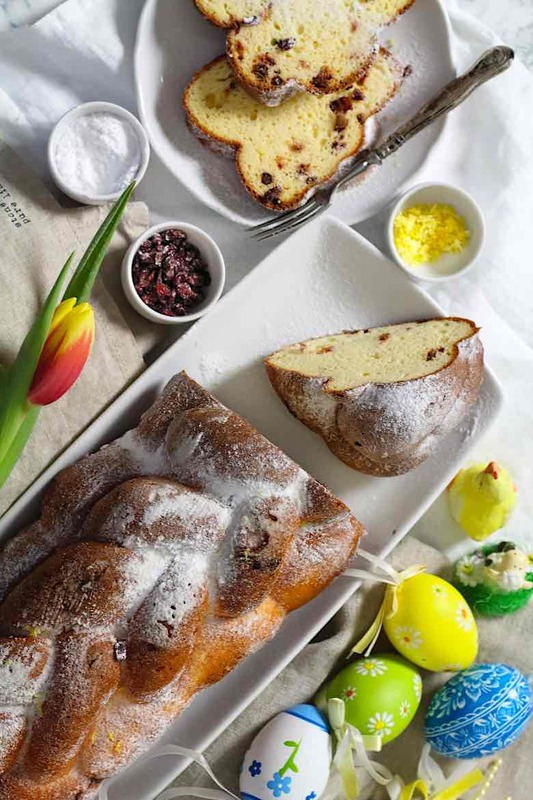 In my country – Slovakia, where I come from, we have identical bread called Vianočka and it is baked mostly during Christmas or Easter Holidays. This plaited or braided bread was and still is the symbol representing Christ child wrapped in cloth. Therefore could not be missed on a Christmas table. Mostly used for breakfast, it was and still is one of the most favorite bread, loved by children because of the sweetness. Those days you can get this bread throughout the whole year in different varieties. Mostly it is on a sweet side, sometimes with added raisins, sometimes dried fruits, in occasion also a rum essence is added. We live in Austria and the same bread is called here Zopfbread, which came from the way it is assembled – by braiding 3,4 or 5 plaits. Some stack those plaids on top of one another. But some just make one level, because of easiness or it, so it really depends on your liking. What countries have Challah or Braided Bread as a part of their traditions? 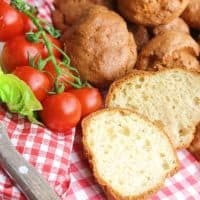 How does Keto Challah Bread taste like? 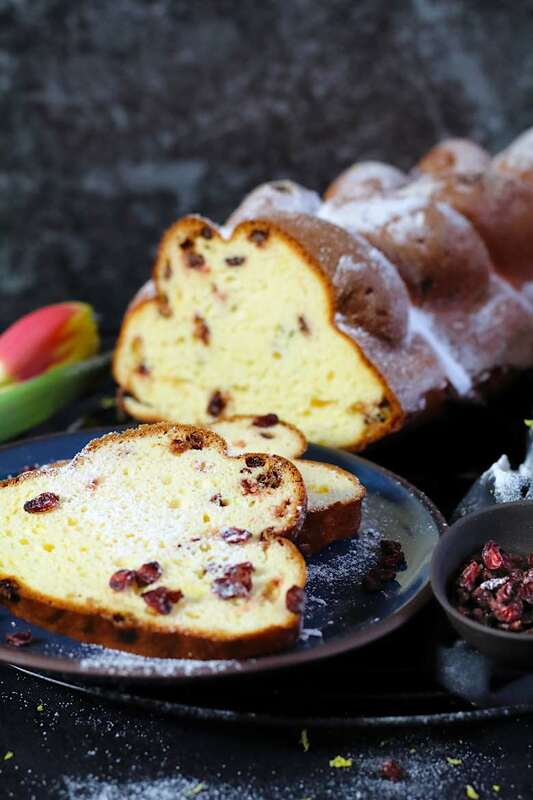 For the ones, who never tried it, it is similar to a brioche not only in color but also texture. Very light, soft, kind of on a spongy side, but just a tiny bit. What is this Keto Plaited Bread eaten with? My memory as a child, we used to eat it either just plain or with the spread of butter on top. The third option used to be to scatter powdered sugar all over, so the sweetness gets even more intense. Some people like to add jams or marmalade on top of butter as well, which for me used to be already a double added sweetness – too extreme to my liking. But we all like it differently, so do try that option as well. 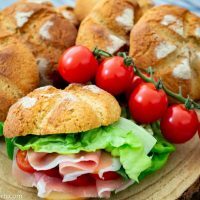 What alternatives are there with Challah bread or Plaited bread? As already mentioned, different countries add a few different ingredients to make it really special. My recipe is made as I remember it as a child when raisins were added into it. But because we are in a Low Carb land, I have decided to replace dried raisins with dried cranberries for lowering the carbs. 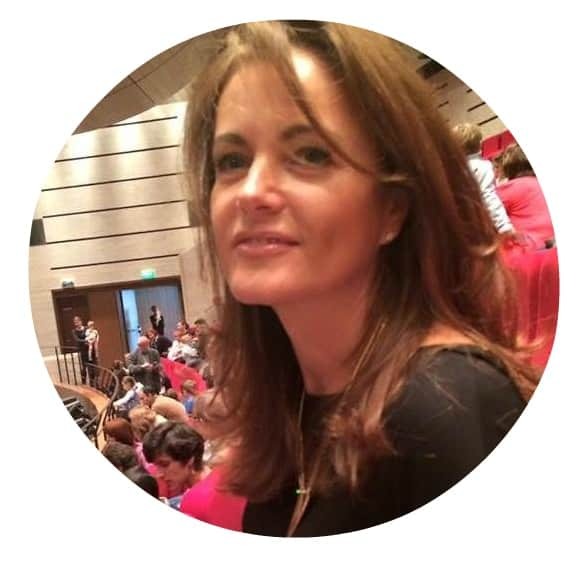 Just in case you would like to make your own Sugar-Free dried cranberries, have a look at my dear friend Carolines Recipe on her website All day I dream about food. Also as I remember it, our way was always laced with sugar for perfection. 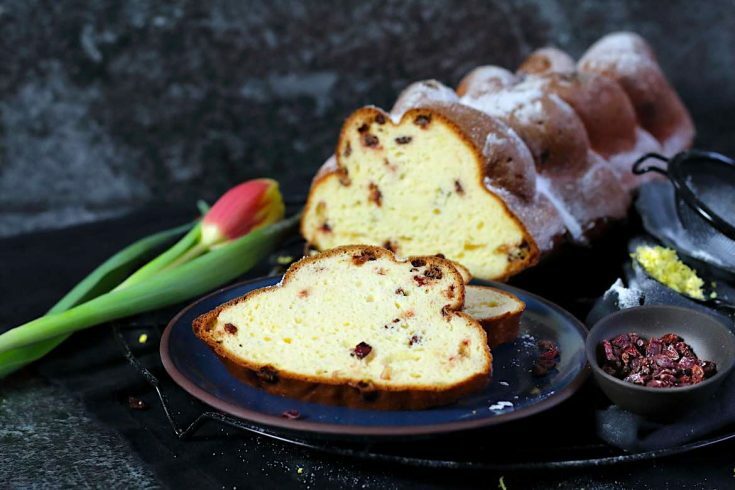 Hungarians, for example, add poppy seeds on top, in Libya, bread is soaked in orange blossom water. In Spain pumpkin is mixed into the dough. You can also add sesame or poppy seeds, flavor it with aniseed, cardamom or coriander. Added spices such as saffron, za’atar, orange flower, rose water, almond oil or olive oil, nuts or candied fruits. But you can also go as far as Mr. Scheft, who invented „holiday“ Challah, which is salty as a pretzel and savory with carrots, parsley, and celery. 1. Try and try and try. Then give up. Then after a few months try again until you get it. I try 100 times if I want to develop something. A great example is those Sugar-Free Meringue Cookies Recipe, where it took me good 4 years to develop. Those were just something I had to make into Low Carb. Because I just so loved them in my previous life, there was no way I could have to imagine my life without them. With this Sweet Keto Challah Braided Bread Recipe, it all came as a big coincident. I have not even planned to make one. I mean, I do love sweet braided bread, but not as much as I did the meringue cookies, so for me, it was not a real must to develop. But then one day, as I was trying to bake one of the thousands of bread recipes for my daughter, one of them had so much reminded me of this light fluffy braided bread called Vianočka in my country or Challah bread as I have discovered at a later stage. It was salty, but I was sure, if I will add this and take this and replace this, something unbelievable can happen. So there I went baking. After about 4th time the Sweet Keto Challah Bread Recipe was just perfect. The only problem was, that the dough was very liquid and it was not possible to braid into a loaf. And on the other side I knew, if I would add more dry ingredients, which will enable me to braided, the bread will become very dense and the texture and taste I wanted to develop so badly will diminish. So there I went onto the internet to look for a baking form, with the shape of braided bread. Tell you, that was not easy. I have seen lots made from aluminum, steel or copper, but as I had experienced before, with baking low carb dishes, there is nothing better than silicone baking form. So, in the end, I have found one, ordered it and baked it. And wohoo, the perfect Sweet Keto Challah Braided Bread Recipe was born. And that even without having to learn how to braid it. Now you can enjoy it as well. I have made it sweet enough, so nothing else is needed to be added for the sweetness, but if you do prefer it salty or not so sweet, just replace the vanilla protein powder with unflavored one. 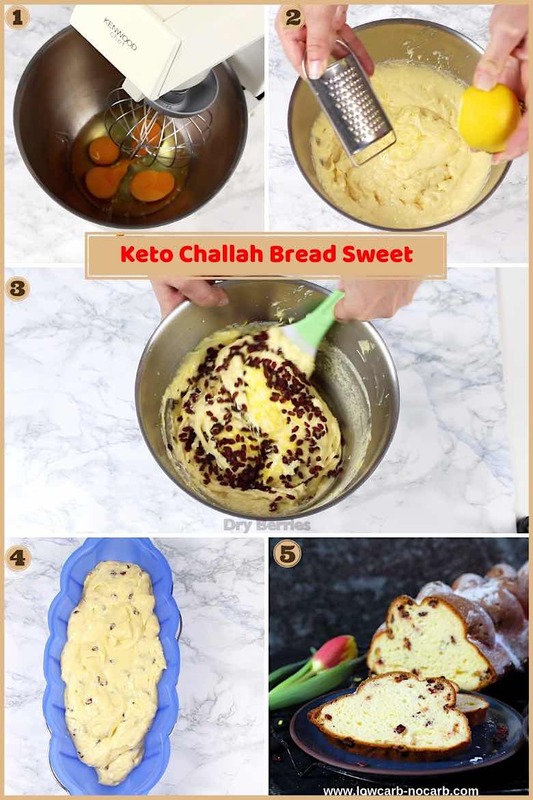 And here goes the perfect Sweet Keto Challah Braided Bread Recipe for you to enjoy. 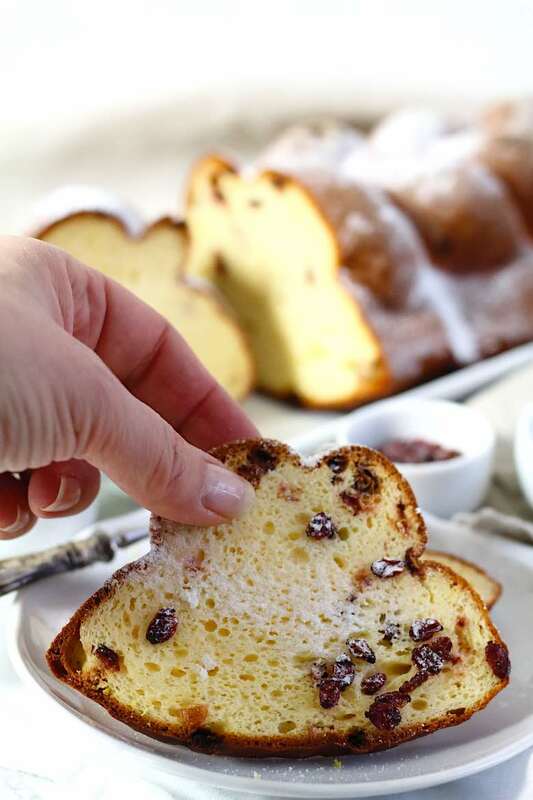 What kind of baking form to use for our Sweet Keto Challah Bread Recipe? The exact measurements of my baking form are: Lenght x Width x Height: 35 x 15 x 7 Cm or 13,7 x 6 x 2,7 Inches. Unfortunately, I was not able to find the exact same one on the internet to purchase, so I have found a similar one in the Amazon shop, which I am attaching a link with an image as well. This should give you the same results and look for Challah Bread. 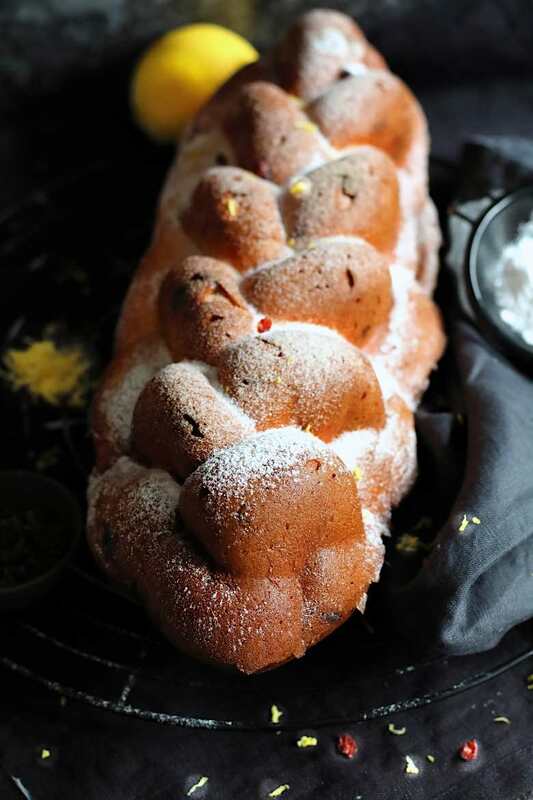 Sweet Keto Challah Bread Recipe (Braided) is made into perfection without Flour, perfect for Low Carb option for Sabbath, Christmas or Easter celebrations. In a separate bowl, mix eggs into fluffiness, then add sugar substitute and mix again. Once that is properly mixed, add all of the dried ingredients and finish it with mixing it all together. Gently hand mix it into the dough, which is then poured into a silicone baking pan, depending on your desired shape. Unfortunately I was not able to find the exactly same one on the internet to purchase, so I have found a similar one in the Amazon shop, which I am attaching link with an image as well. This should give you the same results and look for Challah Bread. And just in case you would like to have a look at some additional bread recipes, the collection is slowly building up. Have you been craving for real rustic bread in our lifestyle? 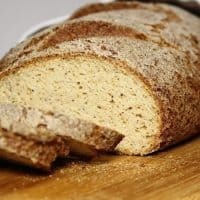 This Keto Farmers Bread is just the answer you were looking for. Real look, ​smell, taste, but still keto. If you would like to be the first one to receive our newsletter with new recipes coming straight into your mailbox, do not forget to register. That is so pretty! Amazing that it isn’t wheat based! Thanks a lot for your nice comment. We all love it as well. a special treat for anyone on the keto diet for sure!! Very into this for Easter!! Have to find this challah bread baking dish! Just in case you do not find it, I have baked in also in other bread like dishes. Looks a bit different, but still worth trying. Definitely time to try. And it is much much healthier as the original version is. Oh my goodness! I didn’t even know this was possible! Challah used to be my favorite bread, before my gluten-free days. This recipe is absolutely amazing! The the sweet touch and dried fruit in it too. Time to try this as well, since it is Gluten Free as well. Wow, this looks so good. I want to eat that whole loaf! Yeah, I almost eat half of it. The bread looks so good. Amazing! Perfect for our Easter celebration. What a lovely treat for anyone on the keto diet! Looks like the perfect loaf of bread! I’m intrigued! This looks just like regular challah bread. You are so right, it is a perfect Challah bread made into a low carb version. Much healthier. This looks just like challah bread, I’m going to have to give it a try! This looks DELICIOUS!!! Thanks for sharing it! Thanks a lot for this comment. I will add it into the notes in the recipe for everyone. And here are sizes of mine: Lenght x Width x Height: 35 x 15 x 7 Cm or 13,7 x 6 x 2,7 Inches. Unfortunately, the exact form I have is not available on the net or I have not been able to find till now. But I have attached a similar one from Amazon, which should give you the same results. Thank you so much Zuzana, I am going to bake this as soon as I order the correct mold. I can’t wait to taste it!!!! Looks AMAZING! Do not forget to send us a picture once baked. Really curious. I made this following recipe to the letter… it didn’t rise at all…thoughts as to what might have gone wrong? I am so so sorry it did not work. I already had few people baking this recipe with success, so it must be something slightly different. It could be the protein probably. There are so many different textures to them on the market. Did you check the video to the recipe? If maybe something you did a bit differently? I would love to find out, so we can repair it. How does it taste otherwise? The challah looks amazing. I can’t wait to make it. Challah is our favorite bread for french toast. Can you use a regular loaf pan if you don’t have the challah mold? Of course, you can. This particular pan I have purchased only for the bread to look like real challah bread. But I have before made it even in a normal bread pan. It works just fine. If you do not mind the shape all is good. I am not one for commenting on recipes unless I am truly blown away. This recipe is a true gift! Thank you! Also wanted to mention that I purchased the smallest size silicone challah mold from amazon and cut the recipe exactly in half and it worked perfectly. I am so happy and appreciate you giving a go for this recipe. Happy you liked it. I remember, when this recipe was finally done to my liking, I was over the moon. I have missed Challah Bread in our lifestyle so much. Well, not anymore. 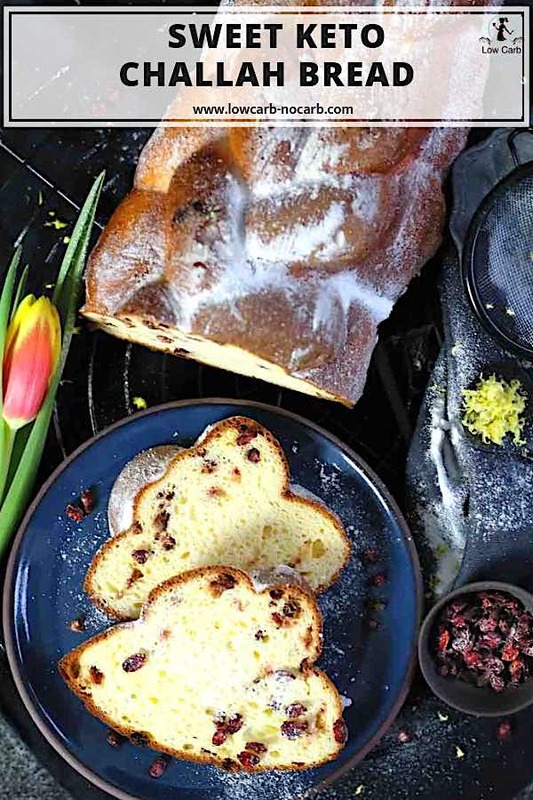 Tried this today as a Greek Easter bread with the addition of mastic, mahleb, orange zest, and orange extract. Cooked the recipe in two smaller pans because that’s what Amazon sent me in mistake, twice. Baked for forty minutes. Not as brown as yours once unmolded. Also, contacted / collapsed as cooled. Did I under or over bake? Also, I melted the butter but only softened the cream cheese before putting everything wet in the food processor with the eggs and Swerve. I am so sorry, this did not work properly. But sometimes certain types of protein acts differently. Another possibility could be that one of the ingredients was warm? Maybe butter or cream cheese? Since you melted them? Also, if the form was pretty high, probably the center could not be baked fully. Try increasing the temperature a bit and keep it longer. 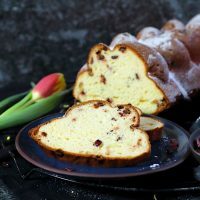 Dear Zuzana, as I am from Bulgaria and this is a recipe for our traditional kozunak easter bread – I am so happy that I found ypur blog and recipe. Can I substitute sucre for powdered sweve/crystallized erythritol? I am happy you found us. I am originally from Slovakia, so you will definitely find lots of recipes closer to your country as well. And yes, you can substitute for Swerve. It is pretty similar. I just grain all of the crystalize sugar sweeteners in a Magic bullet or Coffee grainer into a powdered version. In that way, it gets incorporated much much easier into the baking goods. Dear Zuzana I loved the recipe! Really similar to the real thing! I just have one question. While baking my challah bread got dark on the outside really quickly so i took it out 5 minutes earlier and it was raw in the middle. I out it back and when it was done in the middle the outside was slightly burned. How do I avoid the early browning so it can bake through? I baked on 160C. For the bread to not burn from outside fast, I would suggest covering the top with aluminum foil towards the end of baking. Probably 10-15 minutes before it ends. or you can do it at the beginning and then last 15 -20 minutes take it out. Both ways should work. I am excited to make this! Protein makes my kidneys hurt is it ok to bake without protein powder? I am really sorry to hear, protein is not working well with you. But unfortunately it is not possible to replace it in this recipe. The consistency would change completely.